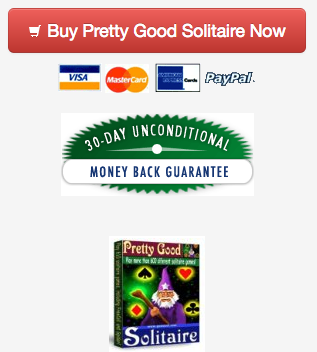 The holiday season is coming again and Pretty Good Solitaire is available from Amazon. It comes in a lovely DVD style case that is perfect for gifts. To buy, just go to http://www.goodsol.com/amazon.html . 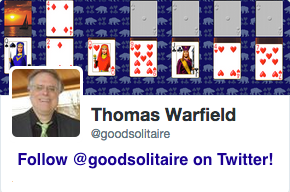 You can, of course, also just go to Amazon and do a search for "pretty good solitaire". Pretty Good MahJongg is also available from Amazon, just scroll down at http://www.goodsol.com/amazon.html . Pretty Good MahJongg is a collection of solitaire games that use MahJongg tiles rather than playing cards. It includes 300 layouts for the classic tile matching game, and 55 solitaire games, including original games such as MahJongg Klondike, MahJongg FreeCell, and MahJongg Spider. You can download the trial version at http://www.goodsol.com/pgmj . The Mac version of FreeCell Plus has updated to version 4.3 and the Mac version of Most Popular Solitaire has updated to version 3.0. These updates contain bug fixes and support for Yosemite. They both require at least OS X version 10.6 (Snow Leopard) or later. To update, run the game, go to the Internet menu, select "Download Latest Version". It will find your code automatically if you have the full version installed. FreeCell Plus is a small collection of only FreeCell type games such as FreeCell, Sea Towers, Eight Off, and Penguin. For more information, see http://www.goodsol.com/freeplus . Most Popular Solitaire is a collection of 30 of the most popular solitaire games, such as Klondike, Spider, FreeCell, Pyramid, Golf, Demons and Thieves, Scorpion, Terrace, Aces and Kings, and Cruel. For more information, see http://www.goodsol.com/mps . The Windows versions of both games updated earlier this year. The Mac App Store versions of both games have also updated, go to the Mac App Store to install updates if you purchased from there. This game is at La Nivernaise.